Our final conference of 2017 was held at the Grand Prospect Hall in Brooklyn, NY. Here's a look at the schedule of seminars, tours, and speakers. Context is everything for traditional building professionals. Whether restoring historic buildings, designing infill structures that reflect a sense of place, or building anew in traditional ways, practitioners want to understand the architectural history and building traditions that demonstrate the history and character of communities. Our speaker, a Brooklyn resident and preeminent architectural historian, will share his insights on the role that neoclassical and romantic revival architectural designs have played in shaping Brooklyn’s character. Give a concise overview of neighborhood development in Brooklyn. List key buildings in Brooklyn that exemplify given architectural styles and vocabularies. Reflect on The City Beautiful movement in Brooklyn and how Brooklyn can inform contemporary city planning today. Discuss the work of architects with important buildings in Brooklyn. The presenters will discuss the restoration of Brooklyn’s Fire Headquarters building, specifically the traditional terra cotta roof. It will detail the roof restoration process from tile identification to historic tile profile and color matching, from manufacturing the tile itself to installation. The Brooklyn Fire Headquarters was designed by Canadian born architect Frank Freeman (1861-1949) in the Romanesque style. Freeman was a prolific architect working in Brooklyn and Manhattan; the Fire Headquarters is among his most highly praised buildings. The roof features some steep hips distinguished by conical caps for turret-like columns and an eyebrow window. Identify and describe historic terra cotta roof tiles. Assess how the color of terra cotta has changed over time and apply the process to match historic terra cotta color for historic rehabilitation projects. Explain how terra cotta roof tiles are manufactured for non-standard installations like cone roofs on turrets, for example. Discuss materials and methods, such as fasteners and underlayment best suited for terra cotta roof tile installation on historic preservation projects. Established in 1838, Green-Wood Cemetery comprises 478 acres in the Sunset Park neighborhood of Brooklyn. It is resplendent with finely crafted mausoleums, gates, and monuments representing many architectural styles and important architects of the 19th and 20 centuries. The tour will explore important architecture in the cemetery and visit with staff conservators to learn about state of the art stone restoration and current conservation efforts at the cemetery. Sites will include Richard Upjohn's Neo-Gothic Gates, Warren & Wetmore's historic chapel, Stanford White and Augustus Saint-Gaudens' mausoleum for the Gardner family, Paul S. Byard's Tranquility Gardens, and more. Green-Wood Cemetery was designated a National Historic Landmark in 2006 by the National Register of Historic Places. List important architects and their work located in Green-Wood Cemetery. Explain recent developments in stone conservation practice. Discuss the application of steam for cleaning stone elements that are part of historic structures or monuments. Apply lessons learned from recent preservation projects undertaken in the Green-Wood Cemetery. This tour will take participants to EverGreene’s new 30,000 square foot architectural arts studio in Brooklyn’s Industry City. Industry City is an adaptive reuse of six million square feet of industrial space on Brooklyn’s waterfront in the Sunset Park neighborhood. Today, artisans, designers, and chefs are at work in this hub of creativity. EverGreene Architectural Arts is one of the largest architectural conservation and restoration studios in North America. Established in 1978, EverGreene’s mission is to provide pre-construction and construction services for significant buildings requiring conservation, restoration or new design. EverGreene’s staff is comprised of designers and makers creating a variety of architectural arts, such as: murals, fine art, decorative plaster and paint, gilding, metals, mosaics and other finishes. Attendees will be able to view the hands-on work being undertaken by EverGreene artisans to restore and, at times, remake crucial interior features. Participants will learn about Industry City as well as observe several design, plaster and mural conservation projects in process. This will be an opportunity to understand the workings of a modern paint and decorative arts studio. Note: Participants should wear comfortable shoes and be prepared for extensive walking and standing. Participants will travel via subway; fare passes are included in the tuition fee. Apply lessons learned from the adaptation of former industrial buildings into contemporary use. Explain values and protocols that drive the organization and execution of preservation practice today. Gain familiarity with a number of conservation practices for a number of historical building materials through observation and Q&A during the tour. Recognize in one’s future work when to call a conservator for work on historic buildings and how to manage that process. The presentation will use the small town of Senoia, GA and its renaissance over the past decade as a case study for protecting and extending existing historic districts through precedent-based infill and redevelopment. Other relevant examples will be included to show how using the planning and architectural patterns of historic main street districts helps to inform new traditional developments. Discuss examples of precedent-based infill development within existing historic main streets. Examine and apply lessons learned from infill and redevelopment in historic main streets to other traditionally inspired new development. Consider the importance of architectural design, landscape design, traffic calming, and pedestrian use of public spaces to historic districts and traditional new developments with regard to their impact on health, safety, and welfare. Discuss the economic and cultural opportunities created by context-sensitive infill development in historic main streets and traditionally inspired new development. Join Clem Labine and Richard Cameron for a thought-provoking discussion about what a rebuilt Penn Station could do for Manhattan and the traveling public. The presenters will examine original drawings of the station from the collection of the New York Historical Society as well as new renderings of a rebuilt station prepared for the National Civic Art Society. They will delve deeply into transportation planning from the historical perspective of McKim, Mead and White’s (MMW) desire to serve modern transportation in a neoclassical setting and why it could be valuable to do likewise in the 21st century. This session will answer some of these questions as well as related political and economic issues plus the challenges posed by the new Gateway Tunnel. Evaluate MMW’s original plan, their vision for serving travelers and why we need to consider the same values for user experiences when planning for urban travel today. Professional opportunities to reconstruct period architecture are rare today. When they come along, professionals are charged with getting the details right…but the project must comply with modern codes. This presentation focuses on the use of long leaf yellow pine used in the reconstruction of the William Woodruff Print Shop at the Historic Arkansas Museum in Little Rock, AK. Once the wood species of choice in 19th century America, long-leaf yellow pine is virtually extinct today. Nevertheless, large beams and structural members once used in warehouses and industrial projects are finding new uses today in floor joists, floor decking, windows, and doors. The instructor will discuss the species and how to adapt the material for new uses including flooring, second floor and attic joists, windows, doors, and mantles. Discuss the history of long leaf yellow pine in American construction. Explain properties of the species that lend itself to reclamation and reuse in new and historic preservation projects. Consider craft processes and their impacts on design and logistical planning for projects when re-milling and finishing historic wood for new architectural installation. Consult and follow Federal and State guidelines and standards for historic reconstruction projects. Speakers: Preston J. Gumberich, AIA, Partner at Robert A.M. Stern Architects (New York, New York); and Breen Mahony, AIA, Senior Associate at Robert A.M. Stern Architects (New York, New York). Responding to the preferences of increasing numbers of university students' to attend schools located in urban centers, surrounded by business opportunities, cultural institutions, shopping and entertainment, and better served by mass transit, the University of Connecticut opened an all-new campus in Downtown Hartford's Adriaen's Landing district in September 2017. Paralleling the flight of corporate headquarters from cities, the University of Connecticut had moved their Hartford extension campus from downtown to West Hartford in 1970; but changing times led to the recognition of the importance of the synergies and accessibility downtown Hartford offered, and the decision to return to the city was clinched in 2013. Built for the University by the HB Nitkin Group, the private developer responsible for recent retail and residential buildings along Front Street, and designed by Robert A.M. Stern Architects, the new UConn Hartford campus incorporates the colonnaded facade of the 1920 Hartford Times Building, preserving, adding to, and reactivating a local landmark that had stood vacant for a dozen years, and adds to it 140,000 square feet of new classrooms, offices, and social spaces around a public courtyard. Evaluate the potential of a historic structure to be repurposed and integrated into new construction. Examine and resolve the variety of technical issues related to the preservation and adaptation of a 100-year-old masonry and terra cotta building. Consider how to integrate institutional uses and commercial uses in a single integrated building while giving each its own identity within a recognizably united whole. Appreciate the challenges and opportunities of bringing an entire campus onto a constricted urban site. This session will offer a case study of a project that combined preservation, adaptive reuse, and new construction to create a 190,000 square foot hotel and condominium residence from a trilogy of eclectic buildings, including an 1880s Neo-Grecian/French Second Empire/Queen Anne red brick building, an 1890s Romanesque building clad in Irish limestone, and a new 46-story tower. Extensive restoration work was completed in the historic core including plaster repair and millwork replication. The building’s atrium, a true centerpiece, features decorative cast iron, terra cotta flat arches, and elaborate tile work. The atrium presented a myriad of code compliance challenges that were solved with an alarm-activated smoke curtain. Introduction of new heating, ventilating, cooling, mechanical, electrical, and plumbing systems were concealed in effective ways without compromising historic details. Consider the design challenges of assembling two distinct historic structures that embody four architectural styles with a modern multi-unit condominium. Look for the potential in buildings with historic designation that have been vacant for extended periods of time. Find solutions with contemporary technology for code compliance and the comfort of building occupants in historic preservation projects that have significant interior architectural features meriting protection. Apply lessons learned about conservation and replication of historic building materials. This case study of the brownstone restoration at the Albany, NY Cathedral of the Immaculate Conception, will offer participants a thorough analysis of problems and solutions for one of Brooklyn’s most widely used building materials: brownstone. 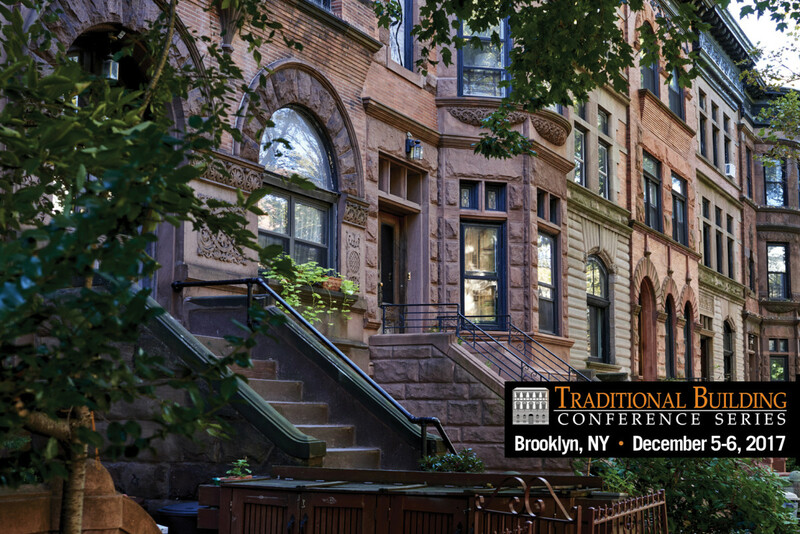 This session will examine essential documentation, assessment, and replication of missing architectural elements and provide insights into the performance characteristics and proper installation of brownstone. Identify the causes of sandstone failure. Evaluate bedding planes and the suitability of stone for its intended purpose. Improve the ability to measure field dimensions for shop drawings when the details are missing and recognize the challenges for stone carvers when they bid on repair work. Appreciate current processes for templating, cutting, and carving stone when both high-tech equipment and traditional hand tools are in use and anticipate the future with improved 3D scanning and robotic milling. Steel Windows and Doors have been in use since Henry Bessemer perfected the manufacture of mild steel, an iron/carbon alloy, in 1884. They have been widely used in residential, commercial, institutional, hospitality and educational buildings ever since. Steel windows and doors are often important elements in historic preservation projects for early to mid-twentieth century buildings. This session presents an in-depth examination of what to look for in evaluating and specifying well-made steel windows and doors for new construction, rehabilitation, or historic preservation projects. List the features and benefits of steel windows and doors for exterior applications. Compare and contrast, on an element by element basis, the advantages of modern steel windows and earlier steel windows. Cite qualities of windows and doors that meet current building codes, regulations, testing standards and energy efficiency targets. Specify steel windows and doors with greater confidence.